or in my case walking. Today was the CHN (Community Health Network) Helping Hands for Cancer 5K run/walk. 5K is about 3.1 miles. It took place around the campus of Berlin Hospital in Berlin Wisconsin. Both my daughters work at this hospital. My oldest daughter is a pharmacist there, and my youngest daughter is the community relations manager. She was very involved with organizing this wonderful event. Heather and Dylan before the race. 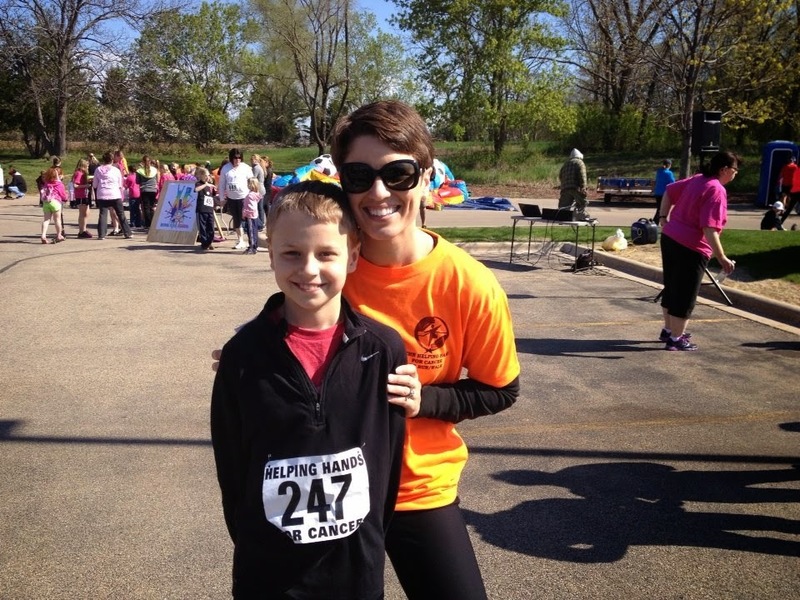 The Helping Hands for Cancer 5K started in 2002, when a local sixth grade girl was diagnosed with cancer. The community came out to raise funds to help her and her family. This girl beat the disease and has grown into a young woman. Because of its success, it became an annual fundraiser. Every year the event becomes bigger and better. It is now the major fundraiser for the hospital foundation. The foundation helps families who need assistance in treatment costs as well as other needs they may have in this stressful time. My husband and I signed up to walk along with my oldest daughter, her husband and my grandchildren. It was to be a family activity. Of course, nothing ever goes according to plans. My grandson got a bad respiratory cold and couldn't participate, so my husband stayed home with him. Another grandson didn't get back from flag football practice with his dad so they didn't run. That left me, my daughter, one grandson and my granddaughter. 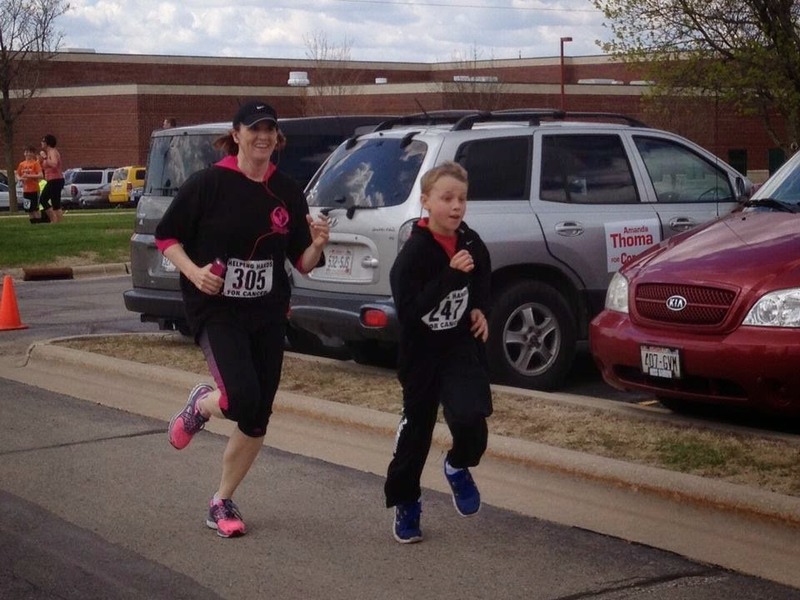 My daughter and grandson took off running at the gun. My granddaughter found some friends and walked with them leaving poor me all alone. It was fine because everyone walks at their own pace anyway. I didn't mind one bit. Sarah and Dylan waiting for the starting gun to go off. Despite the rough start it turned out to be a good time and a beautiful sunny day. Grandpa did well with staying home. I don't really think he minded too much. Sarah and Dylan ran at a good pace and did very well. I enjoyed walking all by myself observing the people and the neighborhoods. I didn't have great statistics, and they may not be totally accurate. They had timing chips that we had to attach to our shoe. I noticed some people didn't have the chip. There were only 18 people over the age of 60 in the race. I placed 7th out of those 18 in that age group. I placed 175 out of 269 women of all ages. Melissa and her friends came in nine minutes after me. They are thirteen year olds. I don't think it is because they are out of shape, I think they were just having fun and aren't all that competitive. Hopefully next year we will all be healthy enough to try again.